Prospects: It would be a big call to suggest Brock-Burrum can’t win theirfifth premiership in the past seven years. While young guns Aidan Johnson and Eddy Ziebarth are big departures to the Ovens and Murray, the Saints have as good a chance as any of collecting more silverware. Matt Seiter is the best ruckman in the league by a stretch and Nico Sedgwick, John-Roy Williams and Ron Boulton are showing no signs of slowing down. The Saints have their share of veterans but bat deep and have built a strong winning culture. Rutherglen pair John Spencer and Tyson Neander could be the icing on the cake. Coaches comment: “It looks like an even competition again so you can’t afford to be complacent or you will get left behind,” coach Kade Stevens. 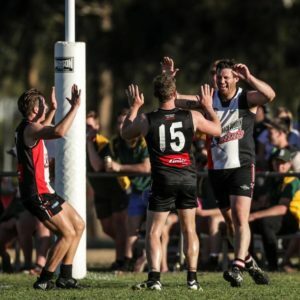 Headline likely to see: Saints start season with thumping win over Jindera in grand final replay. Prospects: After playing off in the past three grand finals, Jindera has been hit harder by departures than any other club in the competition. A combination of factors have worked against the Bulldogs which means new coach Andrew Wilson faces a huge battle to keep them in the top six. Their chances won’t be helped by another tough draw. Huge responsibility will fall on to the shoulders of Ryan Speed, Michael D’Arcy, Tom Weldon and Mitch Lawrence. Coaches comment: “We have lost a few so opportunities will open up for players from the reserves who didn’t get a look in last season for one reason or another,” Bulldog coach Andrew Wilson. Prospects: Howlong’s recruiting strategy was based around improving its depth and coach Beau Packer has achieved his wish. The Spiders have strengthened their spine with Josh Senior, Alex Popko and Aaron Spargo coming on board while Josh Garland will provide another midfield option. Garland won a best and fairest in a premiership season at Glenrowan and, while admittedly he was blessed to be roving to Karl Norman, he shapes as a big inclusion alongside Steve Jolliffe and Matt McDonald. The Spiders will be without key forward Alex Dilger for the opening month due to commitments in Tasmania while Jay Koehler is yet to commit. Prospects: While CDHBU’s depth will again be questionable, the Power are confident of building on their six wins from last season. Jayden Shaw played for Albury’s reserves last season and is a smart mover from the Northern Territory while former North Albury player Wade Dickson will add some class. Dickson is working in Queensland and will play half the season. Andrew Phibbs broke his leg last season and will resume in the early rounds and Matt Howard should be a better player without the travel from Melbourne. Prospects: Henty will be driven by last year’s disastrous finals campaign and has too much A-grade talent to drop out of premiership contention. No other club in the league has a better top four players than Daniel Leslie, Damian Cupido, Jared Brennan and Daniel Cox and their impact will determine how far the Swampies progress. Cupido’s late clearance bid to join Rumbalara has been a distraction but it would be a surprise if Henty budged on his contract. It will be interesting to see how Price uses Leslie with the departure of Spencer possibly opening the door for him to play at centre half-back. Brennan will also be like a recruit after tallying only a handful of games last season due to player point restrictions. 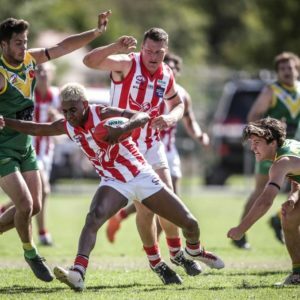 Tiwi Bomber Kim Kantilla is the wildcard in Price’s pack after playing senior football in the Northern Territory in recent years. Won’t want too many injuries as depth could become an issue. Coaches comment: “The boys have worked hard over the off-season and we’re determined to do well particularly after the way last year finished,” Price said. Prospects: The Brookers have retained the nucleus of the side which rocketed up the premiership table last season. Coach Matt Sharp would dearly love more height to help out in attack and through the ruck but he’s still got plenty of run at his disposal. Andrew Dess will be the main focal point, particularly with Andrew Mackinlay trying his hand in the Ovens and Murray after kicking 64 goals last year. Brad Carman’s departure cannot be under-estimated either. Holbrook’s pre-season has been interrupted by a host of its players being heavily involved in cricket. Have a much tougher draw than last season but boast enough running players to feature in late August. Coaches comment: “We surprised a few people last year and hopefully we can build on that again,” coach Matt Sharp said. Headline likely to see: Injury-free Sharp on fire for Brookers. Prospects: The Cats have recruited as well as anyone. Sam Livingstone and Brad Boots will provide further experience in defence and attack while forgotten trio George Alexander, Clancy Galvin and Andrew Clarke are back from serious injuries. Alexander was unlucky to miss out on winning the Des Kennedy Medal in the 2017 grand final before missing last season and could be anything for the Cats. And it gets better. 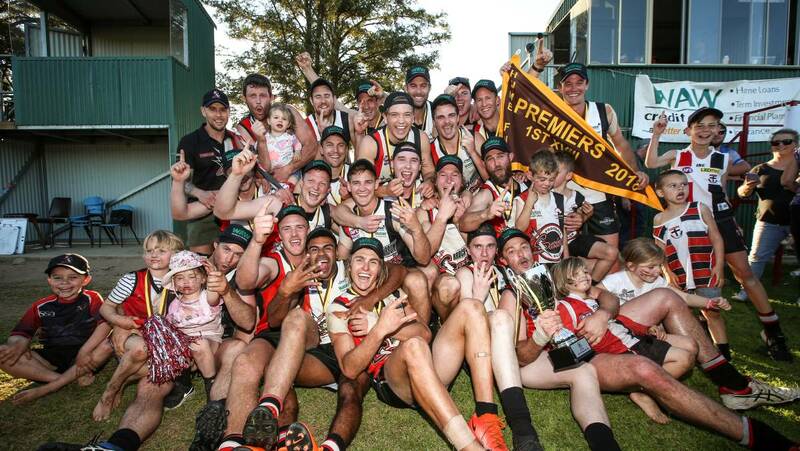 Osborne won last year’s third grade premiership with Ronan Hunter, Lachie Armstrong, Ed Morton and Dan Madden set to be in contention to play senior football. Will Ryan has also returned from Canberra and will be more than handy. Firmly in the mix to win its second premiership in three seasons. Coaches comment: “We’ve had a pretty good pre-season. We have picked up a few and got a couple back from injury so hopefully we can improve on last season,” coach Matt Rava said. Prospects: Will be pressing for a return to finals action after narrowly missing out in 2018. Bolstered their running division with Jack Duck, Tom Holman and Josh Star coming on board while former best and fairest Ryan Lavery will be like a recruit after missing virtually all last season. Lack height in the ruck and down the spine so will need good returns up forward from Myles Aalbers, Nick Turner and Todd Miller. Can set up its season in the opening five rounds with games against Howlong, Murray Magpies, CDHBU, Lockhart and Billabong Crows. Coaches comment: “It was disappointing to drop out of the six after a good 2017 so we’re definitely out to make amends for that this season,” coach Myles Aalbers said. Prospects: The Lions are officially in the premiership window. They claimed their share of scalps last season and recruits don’t come any bigger than full-forward Adam Prior. Prior kicked five goals against Ovens and Murray premier Albury in the final round last season and it would be a surprise if he didn’t push Cupido for league goalkicking honours. While Culcairn’s running brigade is better than most, the ruck remains a problem with coach Josh Hillary unsuccessfully trying to bolster the division over the off-season. Coaches comment: “We’ve shown we can play good football and bringing that consistency to the table is the challenge for us now,” coach Josh Hillary. Prospects: In Al Austin’s four seasons as coach, the Crows have never enjoyed better list retention than this year. Austin will have a group of players with 40 to 60 games of senior experience, plus a handful of handy recruits. Injuries will determine how far the Crows improve, but don’t rule out them jumping several rungs up the ladder. Coaches comment: “We’ve worked really hard to keep the side together so we’re happy with that,” coach Al Austin said. Prospects: While Lockhart has lost five of its better players, the Demons have picked up some talent and expect to improve. Nathan McPherson has returned and put a heavily emphasis on fitness with MCUE recruit Paddy Maher leading the way on the track. Former junior Connor Krebser is back after kicking 60 goals for Collingullie-Glenfield Park thirds last year. 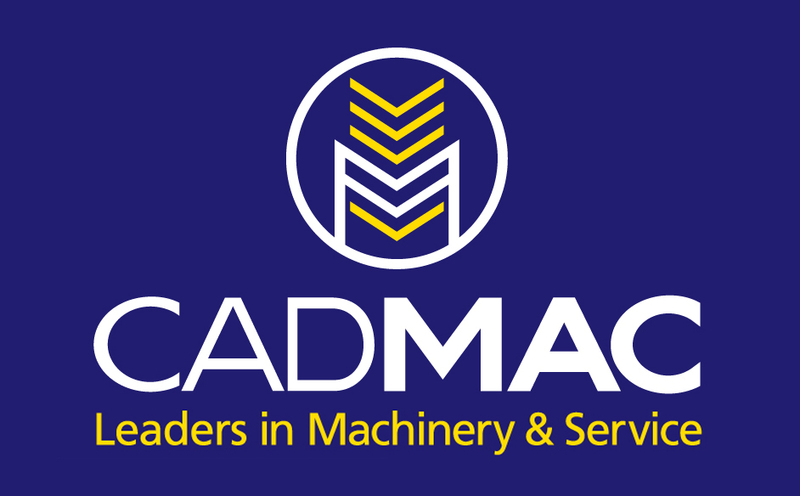 Coaches comment: “We will be a young side and hopefully the improvement comes after working hard over the off-season,” coach Nathan McPherson said. Prospects: The Magpies are odds-on favourites to collect the wooden-spoon. They have lost virtually all their top-liners with the exception of Daniel Maher who has racked up prolific numbers since arriving at Urana Road Oval. The arrival of several youngsters late has boosted club spirits. Coaches comment: “We will focus on the kids and build,” coach Brett Argus.